There are a LOT of threads out there about how to configure an HP thin client for MagicJack. I have to admit, that it can be confusing reading some of it, as some would pertain to the T5700, t5710, t5720, and other mods to OS's. I just wanted a machine to use with MJ. I tried to install all the optional configurations of the OS's and still had some difficulty getting things to work. I did finally have success getting everything working and wanted to pop a guide out for those who have been trying to make sense of the vast amounts of information out there. Just want to have all the information in one place. I will try to make it as step-by-step as possible and make the instructions as clear as possible, trying not to assume that the user skill level is anything but basic. I want to thank all of the contributors who have spent the time to figure out how to make all this work and published the information for us to use. All the information contained in this thread is compiled from those contributors. These instructions assume you are using a Windows PC for the setup and configurations. The only assumption I want to make is that you have a working MagicJack adapter. Verify that the MJ adapter is functioning correctly before using the rest of this procedure. If you have problems, there is likely an answer somewhere on the Unofficial Magicjack Forum site. You will need to obtain an HP t5700 with a 1Ghz Transmeta processor. I believe they made this same model with an 800Mhz processor as well. These instructions have been verified on the 1Ghz unit only. You can obtain these from many places. EBay, Craigslist, or online resellers/refurbishers have them and you can get them for under $100 and in most cases much less than that. http://www.pcmemorystore.com/HP_Compaq-Thin_Client_Series-T5710-ram.htm is a source that I have used. They delivered in 3 days with standard shipping. There are many other places to obtain this memory, Ebay again being one of the places I have seen mentioned on the threads. http://ec.transcendusa.com/product/ItemDetail.asp?itemid=TS1GDOM44H-S is the source I used for the one I installed on my TC. There are other sources, so a little time with Google may get you a better price. As of the date of this post (14 Nov 2008 ) both of these sites are active and items are available. Installation instructions for the Memory modules are pretty straight forward. You will need a small cross tip screwdriver and a small pair of needle nose pliers. There are 2 small black screws located on the back of the TC. Remove those and place them in a small bowl or other place where they will not get lost. Remove the top cover by lifting up and pulling away from the chassis. Place out of the way. There are 2 silver screws located on the exposed left and right sides of the metal box nearest the ports on the back. Remove those screws and place them in the bowl with the other 2 screws. Lift the cover slowly. You will see a pair of wires connecting the motherboard to the speaker. Disconnect the wire at the motherboard. Now remove the metal cover by pulling up and back on the cover. Place this cover out of the way as well. The RAM module will be located on the left side about midway when looking at it with the ports facing you. There are 2 small metal tabs on each side of the module. Gently push the tabs out to the side of the module, and the module will spring up. At that point you can remove the module. Unpack your new 512K module and place into the slot. Once seated into the slot, push it in until you hear a click. Visually inspect to make sure that it is seated correctly and that everything looks OK. The DOM module is located on the right side front of the board when looking with the ports facing you. The pins are pins are on the right side with a small plastic post on the left of the module. With needle nose pliers, gently collapse the plastic retainer wings on the post and gently lift that side of the module to clear the wings. Once cleared carefully pull up on the right side of the module to remove it from the pins. Be careful not to set the hole back under the wings again while trying to remove the module. Once removed, place on a static free surface and set aside. Unpack the new unit and carefully align the pins on the motherboard with the connector, and align the post to the hole in the module. Carefully push down until the module is seated. Visually inspect to make sure everything is seated correctly and that everything else looks correct. Replace the metal top by reversing the removal procedures, making sure to reconnect the speaker wire. Also make sure that the lip in the lid (front side) fits under the lip in the metal case (front side). Reinstall the 2 silver screws. Replace the Plastic cover by reversing the removal instructions, making sure to replace the 2 small black screws. Remember that if you feel resistance when reinstalling anything, stop and make sure that you are doing everything correctly. You should not feel any unusual resistance when installing the modules or the covers. You can obtain an imager and tools for installation of Windows XPe with service pack 2 from the HP website at http://h20000.www2.hp.com/bizsupport/TechSupport/SoftwareDescription.jsp?lang=en&cc=us&prodTypeId=12454&prodSeriesId=339208&prodNameId=379363&swEnvOID=1058&swLang=13&mode=2&taskId=135&swItem=PSG_I22384-106947 . Copy to whatever location you download to on your PC. Please use a 1GB (or larger) thumb drive for this step. Use this link to download the utility to make your USB thumb drive a bootable DOK (Disk on Key) and to get the DOS files you will need to make the bootable USB drive. Follow the instructions on the site to create the USB DOK. The instructions work well for what you will need. Once you have completed the creation of the bootable USB drive, you will need to install the XPe SP2 tools and imager on the DOK. Double click on the Icon for the SP29705.exe file you saved in the earlier step. Follow the instruction on the installation. Once installed, a window will open asking you what kind of ISO image you want to create. Select USB Format. You will be asked to select the drive of the USB DOK. Please make sure you select the drive letter where you have the DOK placed, then click format. Once completed the utility will tell you format is complete. The format takes about 3-4 minutes for a 1Gb thumb drive. Click the OK button and close the window. Remove the USB DOK from your PC. In your working location, place the HP t5700 thin client and connect the video cable, keyboard, and mouse cables. At this time you want to plug the USB DOK into the Thin Client into one of the free USB ports. Plug the monitor into a power receptacle and power on. Plug the DC end of the thin client adapter into the power location near the PS2 port on the back of the unit, and plug in the other end of the adapter into an AC receptacle. The unit should start to boot as soon as power is supplied, but if not, push the power button on the front of the unit. During the HP Splash screen on boot up hit the F10 key on your keyboard to enter setup. Cursor down to “Advanced BIOS Features” and hit the enter key. Cursor down to first boot device and hit enter. Move cursor until USB is selected and then hit enter. Press F10 again and select yes to save. The unit will reboot. The unit will be booting off the USB DOK at this point. If it does not, you will have to re-perform the steps create the USB DOK and / or to install the tools and imager on the DOK. If the TC successfully boots on the USB DOK, you will see a screen full of things happening, then another screen where you will be asked “Do you want to continue [Y/N]?” Type Y and the installation will begin. This takes a few minutes so go grab a soda and a snack and come back in a few. The installation is hands-off. The unit will reboot 3-4 times before it has completed. When it is completed you will have a windows screen with the default HP wallpaper. Once you are booted completely, you will have a regular XP desktop, but you will be logged in as user with no privileges. You will need administrator privileges to complete the rest of the installations and configurations. Thanks to VaHam for the following instructions. 4) Now go to the EWF Configuration in control panel and select “Commit Data to Volume”. This will make the changes to logon on as Administrator persist; otherwise if you just rebooted the TC would revert to the setting you had at the last boot up. This is what EWF is all about. Any changes you make are just temporary when EWF is running and do not get permanently entered into the c: flash drives data unless you instruct EWF to do so by committing data to the volume. Thanks again for VaHam for these instructions. While EWF is great it can be a pain if your making several changes to have to commit each one and reboot in between them. To make life easier we’ll just disable EWF temporarily. Go to control panel and again to the EWF Configuration and this time select “Disable EWF”. The TC will ask if you wish to Commit the Data to the Volume. Select YES and you will then be prompted to reboot again. While the TC is rebooting and on the HP splash screen, press the F10 key on your keyboard to enter setup. Cursor down to “Advanced BIOS Features” and hit the enter key. Cursor down to first boot device and hit enter. Move cursor until ATA is selected and then hit enter. Press F10 again and select yes to save. The unit will reboot. Once the TC has rebooted you’ll notice the little lock icon near the clock is now and open meaning EWF is disabled. For a lot of the rest of the installation/configuration, you will need some room to move packages around. For this you will need to set the RAM Disk size to 64M. To do this, click the start button on the TC desktop. Select control panel. On the left side of the Control panel window, click on “Switch to Classic View”. Double click on HP RAMDisk Manager. Slide the bar to 64MB and click OK. You will be asked to reboot. Select yes and the TC will reboot. Once the TC has rebooted, you will next want to delete unnecessary packages to free up some space. If you want to use the TC for other things as well as a place for your MJ to reside, you may not want to delete all the packages. Thanks again to VaHam for the following instructions. The HP flash image includes several programs which probably will be of no use to you and take up precious space on the internal flash drive. The list below are the ones I suggest you may want to remove. If your TC is currently connected to the internet you can just navigate to the above links and select run to install them onto the TC directly. If not you can download them from your desktop onto you DOK and then transfer the DOK to your TC and execute them from there to load them onto the TC. Executing them is a two step process. First the above linked utility files must be installed onto the TC and then the utilities have to be executed on the TC to perform their jobs of removing the programs from the TC. Each of the utilities once installed onto the TC they will be located in directory “C:\Program Files\Altiris\eXpress\Deployment Server\RIPs”. You will need to navigate to each utility and execute it from there. Once the removal process is completed, you can delete the utility files linked above to save space. Also note in the C:\Program Files\Altiris\eXpress\Deployment Server directory you’ll find Documents and Scripts sub directories. You can also navigate and delete the files contained there to save more space. From the Thin Client desktop, open Internet Explorer. Navigate to the HP site containing the DirectX softpac for XPe at http://h20000.www2.hp.com/bizsupport/TechSupport/SoftwareDescription.jsp?lang=en&cc=us&swItem=vc-65749-1&jumpid=reg_R1002_USEN . Download the file to the RAMDrive (Z:). Once the download is complete, open the file and follow the instructions. Once completed, you will need to locate the extracted file. The default location is C:\SWSetup\SP41409. In that folder double click on the icon Add_DirectX_1.00_C1.exe and follow the instructions. After successfully installing DirectX, navigate to the RAMDrive and delete the SoftPac to free up room on the RAM Drive. Once you have completed the install of DirectX, you will need to run DxDiag.exe. DxDiag can be started by clicking on the “Start” button on the desktop and selecting Run. When the Run window opens, type in dxdiag. The utility will run. Not sure if it is necessary, but I run through each tab and perform all the tests to make sure things are running right. When completed, exit the program. This part is critical. Don't skip this step. Disable SyGate Security agent, and any firewall features you have enabled on your router/firewalling devices. You could probably just poke holes in your firewall (at least UDP 5060-5070 possibly others), but this is the simplest way to get this done, and it only leaves you unprotected for a few moments. To be on the safe side, you may want to turn off other PCs and unnecessary network devices prior to this step, just in case. To disable the SyGate security agent,locate the icon on the application bar on the lower right of the TC Desktop. If you right click on the icon, you will be given the option to disable. Select disable. At this time disable any firewalling you have on your routers as well. I cannot provide any information on how to do that for your particular setup. If you were able to install MagicJack on a PC without disabling your firewall, then I would suggest you try to set it up on your TC without disabling it as well, but I would suggest at least disabling the SyGate agent. Now you are finally ready to install the MagicJack USB device. On the back of the TC, insert the MJ USB connector into one of the spare USB ports. In a few moments the “found new hardware” window will open prompting you to install. You can try to install at this point, and will probably not complete the install successfully. That is OK. Just go through the procedure. If it does not find the correct drivers (you can look on the folders in the device), you will get a message saying that the device did not install correctly. Click OK to exit out. In a few minutes, the Magic Jack splash screen will appear. Wait this out. MagicJack will likely need to update and this can take a few minutes. Once completed the MagicJack soft phone will appear on your screen. You may get an additional registration screen. Follow the instructions and complete the form. Once completed, you should have your phone number on the MagicJack soft phone. If you don't get your number, you may want to plug the MagicJack device back into your PC and let it update, then try to plug it into your TC. Not sure why it works, but it worked for me. Select the Menu button and then select Volume/Headset Control. Check to see if you can select the Telephone button. If you can, pick you your attached phone and attempt a call. If you can, skip the next step. If you cannot select the Telephone button or you cannot get a dial tone, to to the next step. Check the Device Manager and to see if it shows an error - YELLOW QUESTION MARK on the " Internet phone by TigerJet” if so, download the USBAudio driver from http://rs9.rapidshare.com/files/139809142/USBAudio.Driver.zip onto the TC. Extract the files to the Z: drive or other location on the TC that you can install from. On the device manager right click on the Internet Phone By TigerJet icon and select update driver. Navigate through the menu and when asked, select “Install from a list or specific location”. Select the location you extracted the USBAudio driver to and hit enter. Let the install complete. Reboot your machine. When the unit has rebooted, go to the menu button and select Volume/Headset Control. You should be able to select the telephone button at this point. If you can, make a test call. If not, please refer to the Unofficial MagicJack Forum for tips on how to resolve your specific problem. Team Viewer is a free for non-commercial use remote viewer that works well with the TC and MagicJack. It allows you to place the unit at a location with no Keyboard, Mouse or Monitor attached. You can also use Remote Desktop for this, but there have been some problems associated with that solution. Team Viewer can be found at this site http://www.teamviewer.com/index.aspx . Download it on the Z: drive or other installable location and install. You may want to set it up to start the application on system boot. You will have to download and install on each machine you want to monitor from. Once installed on the TC, remove the installer application from the Z:drive if you downloaded it there. Click the start button on the TC desktop. Select control panel. Double click on HP RAMDisk Manager. Slide the bar to 32MB and click OK. You will be asked to reboot. Select yes and the TC will reboot. Ok once you have everything the way you like it, go back into control panel to the "EWF Configuration" and select “Enable EWF”. You’ll note the little lock icon changes to yellow but is still open. You’ll then be prompted to reboot. Select yes and allow the TC to reboot. Once the TC has rebooted your changes should be intact and the little lock icon near the clock should be green and closed. Now your TC configuration is complete. Once you have completed the last step, you should turn on any firewalling you had disabled in the earlier step. As a suggestion I would leave the SyGate application disabled as well. You can keep it from starting on boot by de-selecting that in the Options menu. You should be able to make calls without any problems at this point. 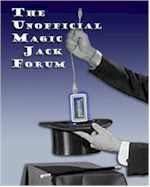 If you have any issues, please look on the Unofficial MagicJack Forum site to help with getting your problem resolved. Occasionally check your device to make sure things are good, and it probably would not hurt to reboot the device on occasion, it is a MS product after all!!. Hopefully this guide has made it a little easier for you to get your HP t5700 working correctly with your MagicJack. I'm working through Jeepsterguy's extremely detailed steps. Great job, not a keystroke or assumption left out. Jeepsterguy's instructions are so clear I'm reluctant to alter a piece of art. The one place where I stalled was removing the unneeded packages. Here are the links for the remove tools for the step "Delete unnecessary packages"
I also removed Sygate security as I"m behind a router firewall. I didn't load Direct X and MJ worked fine. I don't know if it's already in the XPe image. If you are low on DOM space, try skipping the Direct X step. [quote="tony"]I'm working through Jeepsterguy's extremely detailed steps. Great job, not a keystroke or assumption left out. Just bought T7510 and RAM on eBay and ordered drive from Transend. As soon as I got finished with PayPal, I followed Jeepsterguy's instructions for preparing the USB drive with HP's image. I also added all utilities that Tony pointed to. Now all I have to do is wait for delivery. Thank you both for removing the mystery and giving me the confidence to play with a NEW computer toy. The TC is coming from Canada so the other stuff should be here first so I can hit the ground running. I followed Jeepsterguy's instructions for preparing the USB drive with HP's image. I also added all utilities that Tony pointed to. Now all I have to do is wait for delivery. You'll find some of the add/remove utilities on the HP site for the T5710 are the same as from the site for the T5700, but some add/remove utilities are different. Also the XPe image file for the T5710 is dated June 2007 compared to a date of Feb 2005 for the T5700. So worth setting up your USB key from the T5710 specific download site. I was mistaken about what I ordered, it is a T5700 1GHz. I thought I was going o get the T5710, new after failing to win a 1GHz TC for 3 weeks, then I found this. Too good to pass up. RAM from eBAy and Flash from Transend. Hardware upgrade was easy. I couldn't get Citrix ICA to uninstall after 6 tries, so I deleted the directory in desperation:) When I turn on Sygate Security it blocks MJ, so that will stay off. Everything else was smooth. Phone quality seems better than on other, faster computers. And I love the quiet. Now all I have to do is see if I can make the noisy Shuttle K45, it replaces, work with a PCI -PC Card adapter so I use it as a back up for x-rays in the office. Thank you for the help, with out this post I'm sure this process would have taken week instead of hours to finish. I did exact the same way jeepsterguy said and it works great. Thank you for the effort in sharing this information. I have successfully setup t5700 with 256 ram and 256 flash for the magicjack. As a new member, I wish to thank all of you who contribute your expertise on the HP TC for Magic Jack. My question is whether all /or any of the extra utilities listed on the site http://www.bay-wolf.com/usbmemstick.htm are necessary for the DOK and the HP TC . These are in addition to COMMAND.COM, IO.SYS, MSDOS.SYS . Does the XP2 SP29705 contain the utilities needed to support the USB keyboard, mouse and Monitor to be attached to the TC... Thanks again Jeepsterguy, Tony and others..
[quote="lockmaster"]As a new member, I wish to thank all of you who contribute your expertise on the HP TC for Magic Jack. My question is whether all /or any of the extra utilities listed on the site http://www.bay-wolf.com/usbmemstick.htm are necessary for the DOK and the HP TC . These are in addition to COMMAND.COM, IO.SYS, MSDOS.SYS . Does the XP2 SP29705 contain the utilities needed to support the USB keyboard, mouse and Monitor to be attached to the TC... Thanks again Jeepsterguy, Tony and others.. I questioned the need of the extra steps needed to make USB flash drive bootable first, since SP29705 does format the drive. I followed the instructions exactly and had success. Just for kicks, I skipped the above step on a USB adapter for a SD card and it wouldn't boot. It was the only other free memory stick I had large enough. I don't know if it was the adapter and SD, or the skipping of the first step that was the problem. I don't think you need the extra utilities for the TC installation, but I did use them on a smaller flash for possible trouble shooting other systems. HP's operating sysem has all you need for keyboard, monitor and mouse. I just wanted to thank you for this awsome post. It was time consuming, but I just made a call on my 256/256 T5700. Thank you thank you thank you! I am starting a business on the side and I needed my MJ for my phone. One issue that threw me a little was that in my device manager I couldn't find the tigerjet icon, so I guessed and upgraded the icon that had the yellow questionmark. It worked. Thank you again and God Bless. Wow, great instructions. This should be a sticky. I tackled the Thin Client install this past weekend using these instructions. Nothing ever goes perfect, but it's up and running now and I'm happy. I didn't upgrade the memory even though my TC is 1GHZ/256F/256R - it is dedicated to MJ so I didn't think an upgrade was necessary. I noticed when I booted my TC for the first time that it "installed" - so it was like a new machine. So I started at the instructions labeled Set the TC to boot to Administrator. A lot of the instructions before that point was to get to a "clean install" state, I was already there. I linked to this thread from the TC's browser so I could quickly come back to it. To delete unnecessary packages, I used the links provided by tony - but I think I had to search for a couple of the links on the HP site. Important note: I clicked the links and chose run. All this does is install the uninstaller. Make sure you follow Jeepsterguy's instructions to then run the executables from the RIPs directory (I overlooked that originally). I also uninstalled SyGate - I am behind a firewall at home. I didn't install DirectX. Not sure if it is needed or if already installed. Instead of TeamViewer, I installed VNC because I am more familiar with it. Just a note to people installing these remote consoles, install the server portion on the TC and the viewer on other PC's. Again: Thanks for the detailed instructions. Great post. Thanks for making a good "how-to". However I have a few questions. In the Ethernet adapter properties, should "allow the computer to turn this device off to save energy" be unchecked if it isn't already? And second, I've read elsewhere that the audio sound playback and sound recording properties should be changed to "USB Internet Phone by TigerJet", should this become routine as well? Thanks! Why do you put the Server on the TC? That's just the terminology for the node that "serves up" its desktop. In a VNC configuration, the node that you want to view/control (in our case the thin client) is the server, and the node(s) from which you view (another pc on the network) is the, well, viewer. The viewer is just an application, whereas the server is typically installed as a service that listens for the viewer apps and sends display information about its host desktop when connected. I believe it's the same for TeamViewer. You could install both the server and viewer on any or all nodes, but the TC only needs the server. The viewer would be a waste of space unless you plan on using the TC to view/control other PC's on your network. For the record, I also did not install DirectX & it's working OK.
Also, I solved the driver problem as specified, but it began working immediately after the driver installation, without a reboot. This post should be made a Sticky so others can find it easily. Great job, Jeepsterguy -thanks! Posted: Tue May 26, 2009 6:34 pm Post subject: phone or pc? Are you guys using phones with this setup or just the pc?